We use a service called JEXPO for all international shipping services. JEXPO serves as both a shipping service and as a communication mediator between our store and the customer. All questions, orders, or special requests should be made directly to JEXPO using the sidebar of this menu. This service will allow you a simple means of communication with our store. 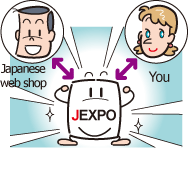 JEXPO will send you an estimate price for any item you wish to order. After that please send the payment directly to JEXPO. We're sorry, but all orders must be paid for in advance. We must first send the item from our store (in Kyoto) to JEXPO (in Fukuoka). JEXPO will then complete the international shipping procedures and ship the item directly to you. The shipping expenses will therefore include both the shipping cost from our store to JEXPO and then from JEXPO to your home address.